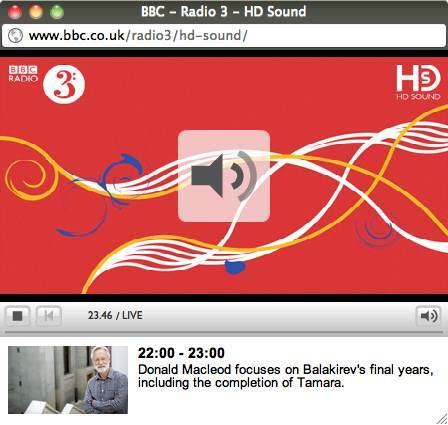 I wrote a while ago about some special events that the BBC were planning to use as opportunities to run trials on broadcasting “HD Sound” streams over the Internet, as a higher-quality alternative to the standard version most people access on from the iPlayer. It’s worth pointing out that common wisdom indicates the difference between the standard 192Kbps stream and the “HD Sound” 320Kbps stream will tend to only be audible on top-notch equipment in ideal conditions. I’ve done some quick listening tests between the two streams on a MacBook Pro 13″ laptop using it’s built-in speakers – hardly the worlds best audio playback system. I was surprised to hear a real difference between the two streams through the laptop speakers. I was even more surprised when my wife was able to hear a difference between the two in a blind A-B test, and correctly attributed the poorer-sounding source as the lower-quality stream. Both are great quality, revealing lots of dynamics in music and both sounding tonally very natural, so far as the laptop speakers allow us to hear. But the difference between the two streams is subtle, yet significant. Spoken word sounds a little clearer on the 320Kbps version, with sibilants (C’s, S’s, F’s, Ph’s) and the breathiness of the human voice sounding more natural, yet being less distracting at the same time. With music, the 320Kbps version gives better tonality, in particular revealing more harmonic overtones of the recorded instrument or ensemble. This bodes well for further listening tests on better audio equipment – an experiment we might find time to carry out tomorrow. In the meantime, I must publicly say a big “well done, chaps” to the BBC staff involved – this is clearly a very audible step in the right direction and backs up a rumoured drive to increase the technical quality of all BBC output, in spite of the cynicism that has surrounded the transition from analogue to digital TV, and is presently surrounding the pained transition from FM to DAB, which may or may not yet be successful. Previous Post Forget new equipment: buy a good brush! Next Post When I pray earnestly, why does God *still* say “No”, or “Wait”?